昔記者。平和グルメ女が日英で綴る米国LA生活。 May your dream come true soon! 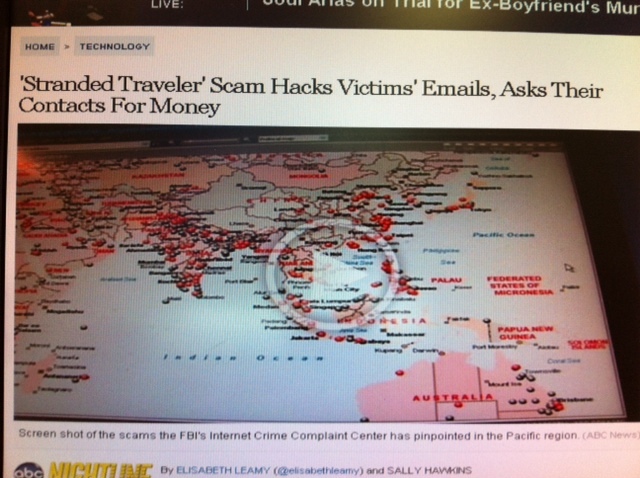 'Stranded Traveler' Scam: I almost fell victim to this scam today. I was trying to send $500 cash to Philippines through Western Union. I'm writing this with great grievance . I'm presently in Manila Philippines.with my Family for a short vacation and we're stuck..And really it was unannounced.We were attacked by four armed robbers on our way back to the hotel where we lodged.we were robbed and completely embarrassed. All our cash,credit cards and cellphone were stolen. We've reported the incident to the embassy and the Police but to my dismay they seem not bothered...their response was just too casual.Our flight leaves in few hours but We've got to settle our bills before We're allowed to leave....Now am freaked out....Please I need you to me loan some money,I promise to refund you as soon as I'm back home. All i need is $1,850 .. Please Let me know what you can do? Write me back so I can tell you how to get it to me.. 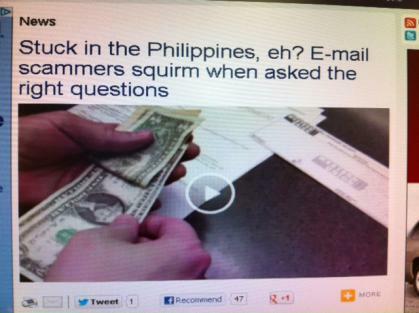 I tried to send $500 to this friend in Philippines through Western Union's website. You can send money in minutes by credit cards (Visa, MC, Discover). But the credit card payment was denied on the website. I called the Credit Card company, and the agent said "OK to charge". But still it was denied at the WU website. I went to my bank, got $500 cash, and drove to a Western Union agent near-by. At the last minute, I thought, "What if this was a scam?" I called our mutual friend M and asked her about it. She replied, "I received the same Email posing another friend before. I believe this is a scam. Her email account must have been hacked and used." OMG What a million questions!!! why you asking me this as at moment ?? Is this just because i asked you of help.. why have you decided to treat me like this, i want you to know that we're meant to help each other. I know this is unusual but you are the only person i could reach at this point and I'm doing everything i can so i can work my way out of here peacefully but there is nothing really working out, most important is that my flight leaves in hours from now and I really need your help. If i wasn't the one i won't have ask you to send the money to my name as we both know i will need some kinda verification before i can pick up the money. Thank God i still have my passport with me for verification. I searched "Philippines, scam" on Internet, and I found some articles about this scam. A same email was sent to a TV staff in Texas in May 2012. I almost fell victim to 'Stranded Traveler' Scam today. Please be careful. ←１クリックでまとめて応援 / 1 Click for All ! I almost fell victim to it. Thanks for your comment. Welcome to "Dream on@LA" blog! I welcome your comments. I live in LA, CA, USA. It's been over 28 years. リンクフリーです。報告も無用です。 Feel Free to link this blog to your blog! Copyright © DREAM ON @LA All Rights Reserved.